Greek violinist, Jannis Agraniotis, was born in Athens and began taking violin lessons at the age of six. After graduating from the German School of Athens and finishing his violin studies in Greece with Vladislav Halapsis, he moved to Germany and studied at the Rostock Music Academy as one of the last students of Werner Scholz and graduated in 2009. He attended master-classes with Heime Mueller, Petru Munteanu, Sergei Kravtchenko and the Petersen String Quartet and has taken lessons with Eberhard Feltz in Berlin. Jannis has appeared in the major Greek concert halls and around Europe as a recitalist and chamber musician and in Festivals around Greece. He has worked for the Greek National Opera, the Athens State Orchestra and collaborates with the Athens Camerata/Armonia Atenea in recordings and concerts in major concert halls around Europe and Greece in both modern and historically informed productions. He has served as a jury member in national violin competitions. 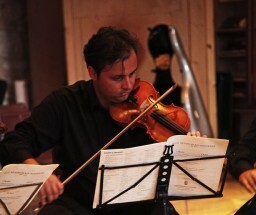 He has been founder and co-director of the Saronic Chamber Music Festival since 2011. Jannis plays a violin made by Stephan von Baehr, Paris 2010.